Welcome to Pompoota Homestead, situated on the banks of the mighty River Murray near Mannum, just an hour's drive from Adelaide. 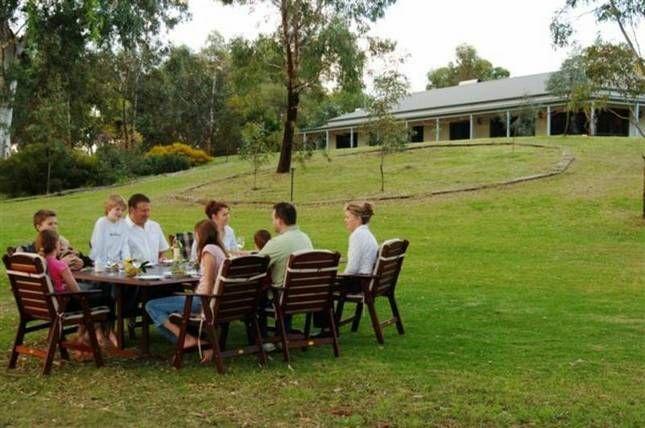 The homestead is perfect for that special occasion with family and friends, with 5 acres of billabong, birdlife and river frontage. Best of both worlds - relax, bird-watching, kayaking, & fishing, or enjoy the river and all it has to offer. With your own Billabong, footbridge to the river front with boat ramp and your own private beach. The all-round verandah, sweeping lawns, 4-burner BBQ, and loads of outdoor furniture, you'll be proud to entertain your family & friends here! So come and enjoy a quiet part of the River Murray with no neighbours nearby! The large homestead sleeps 16, and has a fully equipped modern kitchen, large dining area with a dining table that seats 14, 2 separate living areas, 2 bathrooms and 4 bedrooms. $4000 - 5 night stay. January $700 per night - Minimum 7 night stay. Fantastic place to stay with family and friends. We had a wonderful weekend celebrating my mum's 70th birthday. Pompoota had everything anyone would want and more, very well equipped kitchen, dinning room with lots of seating and wonderful outside seating, lots of things to do and the position of the home is perfect would go back in a heartbeat. Comfortable every thing we needed, enough room, great spot on the river. Absolutely amazing property with an abundance of space. Everything you need right on your door step! So well presented with absolutely everything you need! Perfect holiday location. The house, the amenities, the location ... absolutely could not ask for more. There was no need to plan outings away from the house as it was all on hand. Plenty to keep adults and kids busy.